The governor learns he does have $250,000 in contingency but suggests the Legislature find money for his hometown. 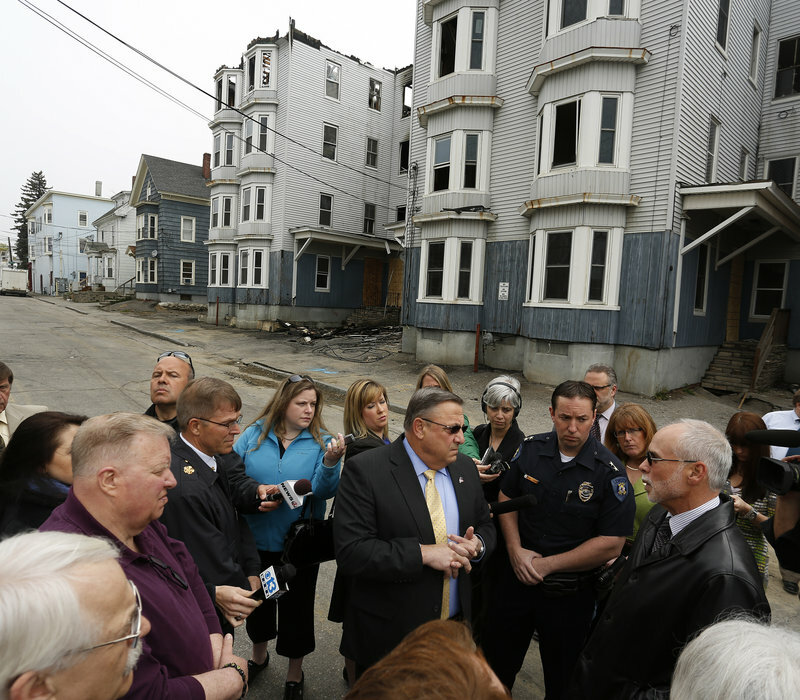 LEWISTON – While reviewing fire damage in his hometown Tuesday, Gov. Paul LePage dismissed a suggestion that he had “discretionary” funds he could tap to help the more than 200 Lewiston residents who have been displaced by three major blazes in the past 10 days. 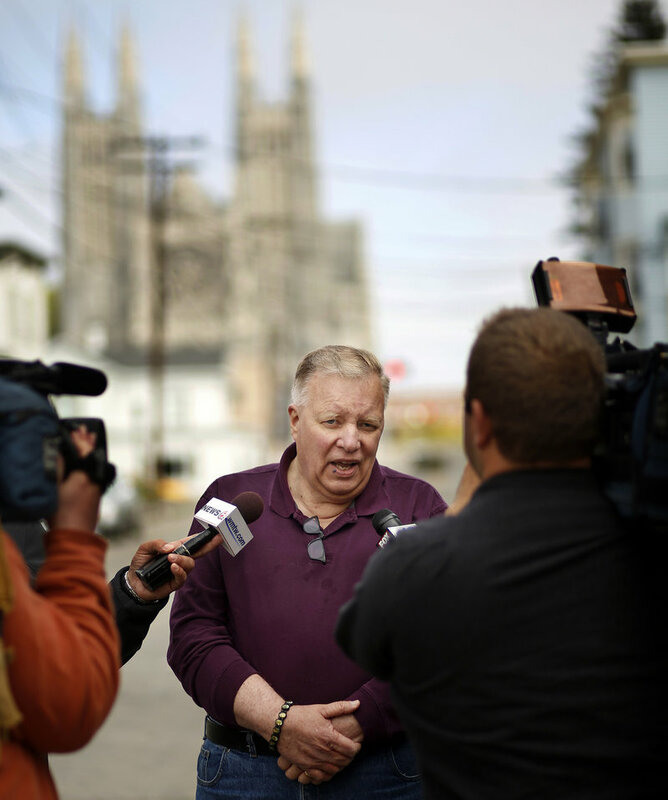 Lewiston Mayor Robert Macdonald talks to the media Tuesday on Bartlett Street. Local residents and businesses have helped fire victims by donating volunteer time and goods. But the governor does have a contingency account, which currently has a balance of about $250,000. Legislative leaders urged him to use the fund to help those left homeless by the Lewiston fires. LePage has used the account in the past to provide additional funding for legal aid for the poor, for an early childhood obesity-prevention program and to hire lawyers to defend the state’s redistricting plan, among other purposes. Earlier this year, he tapped the account to provide $18,000 for an electronic monitoring system for domestic violence offenders. LePage spokeswoman Adrienne Bennett said later Tuesday that the governor was distinguishing between discretionary money and the contingency account, and when he was asked about it, he thought the contingency fund was depleted. Bennett said the governor doesn’t plan to use that account for the Lewiston fire victims. LePage was in Lewiston for about a half hour Tuesday morning. He drove past one fire site and then spent about 15 minutes on Bartlett Street, discussing the fires with city officials in front of two vacant buildings that burned Monday. Dozens of apartments were destroyed in the three fires. Police arrested Brody Covey, 12, on arson charges in the first fire, which was April 29. They arrested another 12-year-old boy on arson charges in the second fire, but say they believe the cases are separate. They have not identified the second boy. Both boys face arraignment hearings on Monday. LePage said those responsible “should be put away,” according to the Sun Journal newspaper. He said the 12-year-olds are old enough to know what they were doing and should be punished “to the fullest extent of the law,” the Sun Journal reported. One local state legislator criticized LePage for declining to provide help from his contingency account. “He does have the money,” said Rep. Peggy Rotundo, D-Lewiston, who also noted that LePage has the authority to shift other funds in the state budget to provide up to $750,000 more for contingencies. LePage suggested that instead of asking him about discretionary funds, the Legislature should provide money on its own to help. He noted that the Legislature’s account for its own operations usually runs a surplus, often because of staff turnover. Sometimes that money is poured back into the state’s General Fund at the end of the fiscal year, or it’s used for legislative projects, such as new copper for the State House dome and upgraded phones for the House and Senate, said David Boulter, executive director of the Legislative Council. Boulter said about $1.2 million of this year’s carryover balance, expected to be about $4 million, will be used to pay for the copper dome. He said the council, made up of legislative leadership, can decide on its own how to spend the money and doesn’t need the governor’s signature. House Speaker Mark Eves, D-North Berwick, who chairs the council, said through a spokeswoman Tuesday that the council will consider setting aside money for Lewiston when it next meets at the end of the month, but he urged LePage to act sooner. “He can do that today by releasing the emergency funds that are needed” in Lewiston, Eves said. Bennett said the LePage administration has reacted quickly to the fires, noting that it helped set up a housing fair to be held Wednesday for landlords, displaced tenants and state and local officials to help find new apartments for the fire victims. She also said the state is trying to quickly replace any identification cards and food stamp cards that tenants may have lost. And the administration is exploring whether it can provide more food stamps — on a one-time basis — to displaced residents who are nearing the end of their eligibility and to individuals who may have lost cash in the fires. She said the Lewiston office of the state Department of Health and Human Services assisted about 240 people who stopped in on Monday alone. Ed Barrett, the Lewiston city administrator, said local residents and businesses have been especially helpful to the fire victims, donating volunteer time and goods, including clothing, to those who lost everything in their apartments. He said one local business even offered a bulldozer to knock down buildings gutted by the fire. Rotundo said she appreciated LePage’s visit Tuesday, but she wished he had spent some time meeting with residents directly affected by the fires. An indication of why the governor might have left his hometown relatively quickly came when he was asked if he was happy to be back in Lewiston. When he was 11, he ran away from an abusive father there and was homeless in the city for two years. “It brings back a lot of bad memories,” he said. When asked about his brother – who is believed to have lived with his wife in one of the buildings heavily damaged in the April 29 fire, according to a Sun Journal story Saturday — LePage said only that it was a private family matter and he would not comment further. Bennett also declined to comment. She said that on his way out of town, LePage’s spirits were lifted by a stop at a favorite bakery.